A cover that would make MANOWAR blush and a name directly off the shelves at your local computer games store – that may well be a profitable concept for success. Behind the name DEATH DEALER is Ross the Boss (ex. MANOWAR, solo), guitars, Rhino (ex. MANOWAR), drums, Stu Marshall (DUNGEON, EMPIRES OF EDEN), guitars, Mike Davis (LIZZY BORDEN, HALFORD), bass, and Sean Peck (CAGE), vocals. Nuff said. Opener “Death Dealer” is one of the best in 2013. It is a vocal excess, Sean and someone doing a husky film promotion background vox, plus a pace and a heaviness that explodes into the refrain. The compelling “Never to Kneal” keeps the pace and pressure, and almost reaches the same heights. 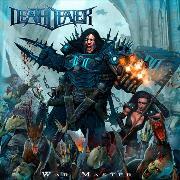 The pompous opening of “Warmaster” erupts with the slightly effect enhanced refrain in an epic style hit. It is almost a surprise to find a soft guitar picking part opening up “Children of Flames”. The only drag is that it reminds me of METAL CHURCH´s “Watch the Children Cry”. The riff of “Curse of the Heretic” really gets me going, completed with pace, pressure and a refrain to die for it is one of the many highlights. The less inspired moments are the somewhat simple “Hammer Down” and more bland “Heads Spikes Walls”. But the less inspired here are slightly above average when I think about their competition. “The Devils Mile” sees Sean at his very best, alongside the quality refrain and some truly inspired drumming from Rhino. The wrap of “Wraiths on the Wind” is also a highlight of the year, as is most of the album. Seven tracks are massively memorable and there are no real fillers. While you do the math’s you might as well post an order, because this will be top 10 2013!